And the curious mind of a (beginning) beekeeper is astonishing. As your passion for bees begin to grow, you start to love them and want to know everything about them. You will be surprised by your intellect to learn at such a speed. And the mystique being that is called a bee will open a world you could not imagine. Along the journey the beekeeper will start to notice everything is connected. Ask a new or experienced beekeeper about his bees and he will not stop talking about his ladies. Beekeepers are always eager to learn, but are also quite stubborn people. Every beekeeper has is own methods to deal with specific circumstances. Among beekeepers there is a saying: “ for every 100 beekeepers there are 101 beekeeping methods”. The knowledge is overall the same and the framework of keeping bees is known. But the details are filled in by the beekeeper themselves. I have a different way of working than my father and this is fine. 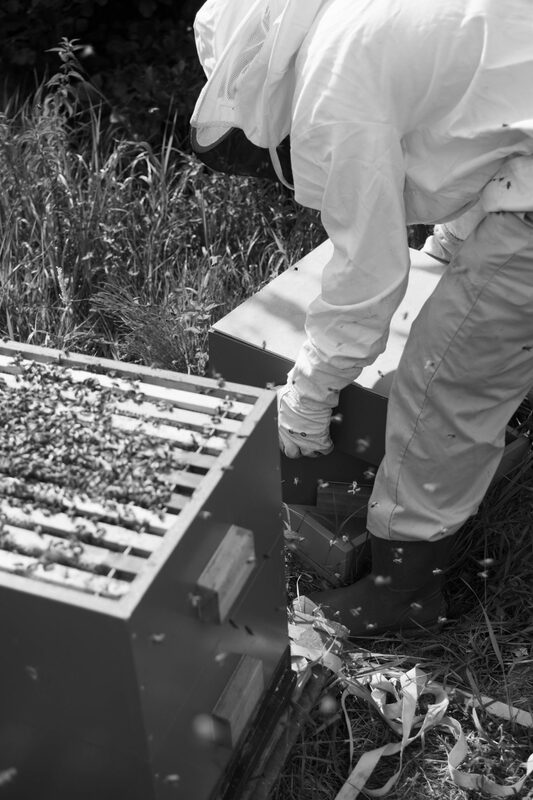 The most important aspect of beekeeping is the well being of the hive and this should always be a priority. It is important as a beginning beekeeper to start reading and keep reading, make it a habit. Educate yourself about the inner workings of the bees. Always be curious. Use knowledge as your basis and your framework. Reading can be a real eye opener on the inner workings of the hive. But the only problem still is these are only words. The bees will not behave specifically as in a book is described. And every beekeeper has is own methods about dealing with his or her bees. After a few months of ferocious reading, you start to get impatient. Because you want to apply your knowledge. For me this was very annoying because it was still winter when I finished most of the reading and just wanted to start beekeeping. But as the bees will teach you the time should be right to work with them. At the start of the beekeeping course, you will get a few theory lessons on the bees. For some beginners this is all known material because they did most reading in their spare time by interest. As spring is nearing and the temperature slowly rises, also the time approaches to really start the first beehive inspection. If you are following a course or learning it from a mentor. It all starts often to slow, you want to go all in and do it by yourself. It all looks so easy with the mentor. But the most important thing is patience. In my case I thought it was all too easy and it would be done quickly in my own hives. O God, what was I wrong. When inspecting the first hive; it started by not having everything prepared. My smoker was not producing enough smoke and because it was early in the morning it the hive was not warmed up enough by the sun. The bees did not appreciate me being there. The result were annoyed bees and a little anxious beekeeper. It was nothing like I read in the books or the stories other beekeepers tell about their beekeeping. You always hear the beautiful stories about peaceful bees and how to enjoy the hive inspections. As a beginning beekeeper this stories can all seem so unreal. So stubborn as I was continued the inspection and after finishing the first hive. I started doubting my beekeeping career. Meanwhile the other hives warmed up by the sun and I noticed the bees were more relaxed. And inspection of the other hives were tolerated better. Every hive is different and every beekeeper is different. You should find your own way of beekeeping and take the time to learn it. The biggest mistake you can make as a beginner is wanting to go too fast. Bees have their pace of working and so does the beekeeper. When you are with the bees, you should see yourself as their guest. It is very important to work with your bees and not against them. As a starting beekeeper the hive inspections are the most exciting to do. It is better to work with the hive than against it. What is meant by this, is look at your bees. Do not make sudden movements and always be prepared before entering a hive. Take time to prepare your smoker, suit up and have everything available before you start. Nothing is more annoying than missing a tool when performing the hive inspection. Beekeeping is more than hive inspections alone, I enjoy watching the bees maybe more than the inspection. Schedule some time to look at the bees, take a chair and sit near the entrance. When you look at the entrance you will see patterns. You will notice the guardian bees watch for unwanted intruders. You will notice the bees will fan from time to time, spreading a scent with their nasonov gland or fan with their wings to regulate the temperature. You will even see peaks in fly hours and bees coming home with a variety of colors in bee pollen. I always start wondering what kind of flower or tree the pollen mightcome from. Sitting next to the hive does not have to be a time consuming exercise. Everybody can make time to visit the bees. If you have the bees in your garden it is easier to do than when you have to drive a couple of kilometers. It can be a form of cheap entertainment, some people go to the gym or watch television. But I go to my beehives, it can be relaxing to watch the bees on a nice summer evening after a day’s work. It can give a different perspective to life. For a beginning or more experienced beekeeper reflection is important. During the beekeeping course we all adopted a hive. On the top of the hive a one page journal was positioned. On the journal the amount of food, queen availability, brood size and hive size are noted. For an small beekeeper it is easy to remember up to a few hives what needs to be done. But when you start to grow the hobby a minor mistake is easily made. Documenting the progress of the hive is very helpful. For me it is sufficient to note only minor details. But I know beekeepers who will set up whole data bases for each hive and every year. They set up whole spreadsheets with graphs and year reports. This can be a little too much for some people. But it is definitely advised to maintain some kind of journal. Beekeeping is a never ending journey of learning, in every beekeeping season the bees will surprise you. Be prepared and read about new developments in research. Don’t be afraid to act in beekeeping. But be sure the actions you take be thorough. To recap this piece. Be curious, read ferocious and reflect on your actions and let the bees be your guide on this wonderful journey, because there is a whole new world unfolding. The only thing you have to do is be open to it. So wonder, Learn and Reflect.